Hello! 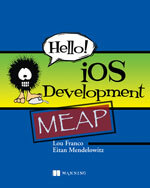 iOS Development is a book I co-wrote with Eitan Mendelowitz. Manning’s Hello! series is aimed at combining a visual tutorial style with humor to make learning technical topics fun. The books are supplemented with User Friendly comics that have been adapted to relate to the topics in the book. Check it out on Facebook or buy a copy of Hello! iOS Development right now.